A council house is a form of British public housing built by local authorities. 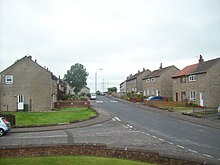 A council estate is a building complex containing a number of council houses and other amenities like schools and shops. Construction was mainly from 1919 after the Housing Act 1919 to the 1980s, with much less council housing built in recent decades. There were local design variations, but they all adhered to local authority building standards. House design in the United Kingdom is defined by a series of Housing Acts, and public housing house design is defined by government directives and central governments' relationship with local authorities. From the first interventions in the Public Health Act 1875, council houses could be general housing for the working class, general housing, part of slum clearance programmed or just homes provided for the most needy. They could be funded directly by local councils, through central government incentive or by revenue obtained when other houses were sold. Increasingly, they have been transferred through the instrument of housing associations into the private sector. A programme of council house building started after the First World War following on from the David Lloyd George’s government’s Housing Act of 1919. The 'Addison Act' brought in subsidies for council house building and aimed to provide 500,000 "homes fit for heroes" within a three-year period although less than half of this target was met. The housing built comprised three-bedroom dwellings with parlour and scullery: larger properties also include a living room. The standards are based on the Tudor Walters Report of 1919, and the Design Manual written according to the 1913 building standards. In 1923 the Chamberlain Act withdrew subsidies for council houses except for private builders and houses for sale. Councils could undertake to build houses and offer these for sale but also to sell off some of their existing properties. This was essentially reversed by the incoming Labour government of 1924. The Wheatley Act (1924) passed by the new Labour Government introduced higher subsidies for council housing and also allowed for a contribution to be made from the rates. The housing revenue account was always separated from the general account. This was a major period of council house construction. The Housing (Temporary Accommodation) Act 1944 led to the building of prefab bungalows with a design life of ten years. Innovative steel-framed properties were also tried in an attempt to speed up construction. A number survive well into the 21st century, a testament to the durability of a series of housing designs and construction methods only envisaged to last 10 years. The Burt Committee, formed in 1942 by the wartime government of Winston Churchill, proposed to address the need for an anticipated 200,000 shortfall in post-war housing stock, by building 500,000 prefabricated houses, with a planned life of up to 10 years within five years of the end of the Second World War. The eventual bill, under the post-war Labour government of Prime Minister Clement Attlee, agreed to deliver 300,000 units within 10 years, within a budget of £150m. Of 1.2 million new houses built from 1945 to 1951 when the programme officially ended, 156,623 prefab houses were constructed. Mainly during the immediate post-war years, and well into the 1950s, council house provision was shaped by the New Towns Act 1946 and the Town and Country Planning Act 1947 of the 1945–51 Labour government. At the same time this government introduced housing legislation that removed explicit references to housing for the working class and introduced the concept of "general needs" construction (i.e., that council housing should aim to fill the needs for a wide range of society). In particular, Aneurin Bevan, the Minister for Health and Housing, promoted a vision of new estates where "the working man, the doctor and the clergyman will live in close proximity to each other". The Addison Act 1919 houses were usually three-bedroom houses with lounge and scullery, sometimes also with a parlour. Some had two, four, or even five bedrooms, as well as generously-sized back gardens intended for vegetable growing. At most they were built at 12 houses per acre (30 houses per hectare). They were generally built to the recommendations of the Tudor Walters Report. Examples are found in Downham, Watling Estate, and Becontree. The Chamberlain Act 1923 reduced the expected standards. The Wheatley Act 1924 attempted to restore some of them. Under the Addison Act, a house would be 1,000 square feet (93 m2) but after 1924 it would be 620 square feet (58 m2). This was a major period of council house construction. All prefab units approved by the Ministry of Works had to have a minimum floor space size of 635 square feet (59.0 m2), and the sections should be less than 7.5 feet (2.3 m) wide. These "service units" had to include a combined back-to-back prefabricated kitchen that backed onto a prebuilt bathroom, so water pipes, waste pipes and electrical distribution were all in the same place, and hence easy to install. The house retained a coal-fire, with a back boiler to create both central heating and a constant supply of hot water. Thus it had a bathroom included a flushing toilet and man-sized bath with hot running water. In the kitchen were a built-in oven, refrigerator and baxi water heater. All prefabs under the housing act came pre-decorated in magnolia, with gloss-green on all additional wood, including the door trimmings and skirting boards. In one-, two- and three-bedroom dwellings, one flushing toilet is required, and it may be in the bathroom. A semi-detached or end-of-terrace house for four people should have a net floor area of 72 square metres. A dwelling for three or more people should have enclosed storage space for the kitchen of 2.3 cubic metres. Dwellings should be fitted with heating systems that maintain the kitchen and circulation space at 13 degrees Celsius, and the living and dining spaces at 18 °C, when the external temperature is −1 °C. The Radburn layout. Maisonettes on Teak Avenue, on the St Ann's estate, Nottingham the facing houses are on Tulip Avenue. Nottingham. The upper houses are accessed from this walk way, while car access is limited to the crossing roads. The Radburn housing layout that aimed to separate cars from housing was used extensively in New Towns. As a result, the houses are accessible to the front only by footpaths. This has created areas with poor surveillance, particularly over car parking at the rear, which have become the focus of crime. In Skelmersdale, tenants are calling for their Radburn style housing to be remodelled so that defensible space is created with parking close to their homes and a reduction in general use areas which give rise to anti-social behaviour. ^ a b c Housing in Wolverhampton 2012, 2. ^ Housing in Wolverhampton 2012, 3. ^ a b c National Museum of Wales 2007. ^ a b Sturgis 2003. ^ Panagidis, Andreas; Savva, Navia (2015). "ENTRY #411". ^ Manoochehri 2009, p. 70. ^ Design of Homes 2010. ^ Regions Nineteenth Report 2002. ^ Barnes, William (20 January 2009). John English (ed.). "The Future of Council Housing". Journal of Social Policy. London: Croom Helm. 12 (02): 268. doi:10.1017/S0047279400012691. John M. "A History of Council Housing in Wolverhampton". geograph. Retrieved 18 November 2015. Hanley, Lynsey (2012). Estates : an intimate history. Granta: Granta. ISBN 9781847087027. Kennett, John. "Case Study:Progress Estate". Ideal Homes -A History of the South East London Suburbs. University of Greenwich. Retrieved 18 November 2015. Manoochehri, Jamileh (2009). "Social policy and housing: reflections of social values – UCL Discovery" (PDF): 413. Retrieved 18 December 2016. Pawley, Martin (1993). "A dose of morphine". Frieze magazine. Archived from the original on 6 January 2009. Retrieved 2010-01-02. Sturgis, Matthew (11 October 2003). "The century makers: 1945". London: The Telegraph. Retrieved 2 January 2010. "The History of Council Housing". The History of Council Housing. University of the West of England. Archived from the original on 3 December 2015. Retrieved 19 November 2015. "A permanent home for a temporary house – the prefab at St Fagans". National Museum of Wales. 2007. Retrieved 2 January 2010. Homes for Today and Tomorrow: more on the Parker Morris standards. 18 December 2010. Retrieved 7 May 2016. 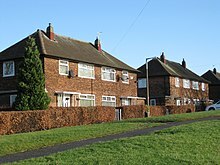 Wikimedia Commons has media related to Council housing in the United Kingdom. BBC NEWS: "Council home for sale at £895,000". Website of the campaign to "Defend Council Housing" against privatisation. Council house exchange Describing how mutual exchange schemes operate. Harold Hill: A People's History Recollections of former and current residents of the Harold Hill council estate.